Discount Iron Mike C-82 Pitching Machine - Free Shipping! The most lightweight version of a true, arm style pitching machine, the Iron Mike C-82 is a mini version of the same pitching machine you see at most public batting cages. Although it is not recommended for high school baseball or fastpitch softball players because it cannot reach speeds as fast as pitchers are throwing at that age group, the Iron Mike C-82 is a great machine for younger players. Batters get better when they perfect their timing and there is no better simulator of a real pitcher than seeing the "arm" of the Iron Mike C-82 Pitching Machine load up before delivering a pitch. The C-82 can throw baseballs or softballs, holding up to 25 baseballs or 20 softballs (11 or 12 inch) and pitching them from 20-60 MPH. It is great for fast pitch or slow pitch softball practice, too. Unlike wheel pitching machines, no stress is put on the balls,so it is a great solution for people who want to practice their hitting with real balls. That's why so many major league teams use them! Select from a Baseball, Softball or Combo pitching machine, which affects whether we send just a baseball arm, a softball a,rm or both baseball and softball arms. While it is true that, at 175 pounds, the Iron Mike C-82 is heavier than any wheel driven pitching machine, it has a set of 2 wheels attached to the base and is still portable enough to be easily wheeled from one spot to another. Just tilt it up and push it where you want it to go. It runs on 110 volts AC and can be plugged into any ordinary electrical outlet. Manufactured by Master Pitch - the inventor of the first commercial pitching machine - Iron Mike pitching machines are the most widely used pitching machines at public batting cages because they are super durable. Iron Mike C-82 pitching machines are very low maintenance - they only require periodic tightening of nuts and bolts as well as occasional greasing of the chain and a few other spots. They include a 1 year manufacturers warranty, as well (see the "Warranty" tab, above, for full warranty details). It is powered by any standard 110 volt electrical outlet. If you do not want to miss the first couple of pitches, consider adding a remote control on/off switch with your order via the check box above the Add To Cart button. The 80 foot long cord will reach from the pitching machine to the batter's area in even the longest of batting cages! IMPORTANT: Iron Mike pitching machines are quite heavy and lift gate service is not included with the delivery. It is your responsibility to get the pitching machine from the curb to wherever it is that you want the pitching machine. 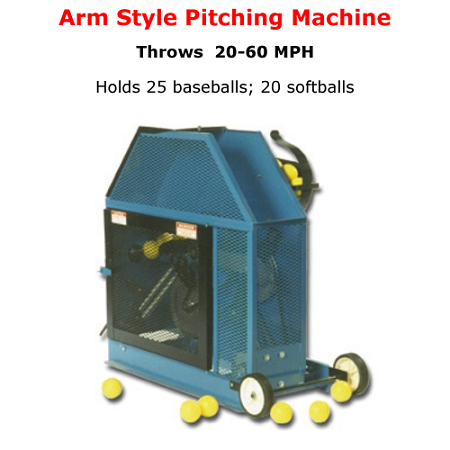 Iron Mike C-82 pitching machines can throw any type of baseball or softball (11 or 12 inch) - lite, dimpled or real balls. In fact, Iron Mike machines are the best pitching machines to use with real balls. To ensure your satisfaction, Iron Mike C-82 pitching machine motors are covered by a 1-year manufacturer's warranty. Electronic circuit boards on the control system are warranted against component failure for 30 days after installation or a maximum of 60 days after shipment from the factory. Warranty for electronic circuit boards does not cover damage caused by severe electrical surges, electrical storms or accidental damage by servicing technicians. Pitching hands, pitching arms, power cables, and power springs are specifically excluded from the warranty. No matter where you order an Iron Mike C-82 Pitching Machine from, NOBODY actually stocks them; they all ship directly from the manufacturer's warehouse located in Kansas City, Missouri. Therefore, the shipping time frame is exactly the same no matter what website you order from (we hope that it is this one!). Iron Mike C-82 Pitching Machines typically take 1-2 weeks to ship from the time you place your order. They ship via general ground freight carrier and could take a week to two weeks to get to you AFTER being shipped, depending on your proximity to their warehouse. PLEASE NOTE: Iron Mike pitching machines are quite heavy and lift gate service is not included. It is your responsibility to get the pitching machine from the curb to wherever it is that you want the pitching machine. Expedited delivery IS NOT available!